Is the meeting place somewhere that is easily accessible by public transit? Is the meeting place in a well-lit area that feels safe for pedestrians? Is the meeting place accessible for people with mobility issues (e.g. people using wheelchairs or canes)? Is the meeting place in a spot where everyone will feel comfortable (e.g. not in a church of a specific denomination or in a building normally inhabited by men)? Is the meeting time convenient for women and/or girls who go to work and/or school? Is childcare provided for mothers so that they are able to attend the meeting? Are there translators at the meeting for women and girls who do not speak in the majority language? (Cowichan Women Against Violence Society, 2002, page 3/35). Example: Cafecitos” held by Latinas Organizing for Reproductive Equality, Chicago, USA (2007) Chicago-based Latinas Organizing for Reproductive Equality (LORE) has held community “cafecitos” in order to engage women to talk comfortably about their sexual rights. At “cafecitos”, women are invited to sit down, drink ‘café’ (coffee), eat snacks and share their thoughts and ideas with each other in a trusting environment. This strategy could be used by a safe cities for women programme in order to mobilize women to talk about the safety issues they face in the city or community, and about their ideas for action to make spaces safer. Source: Russo, A. and M Spatz. 2007. Communities Engaged in Resisting Violence. Women and Girls CAN. Chicago: page 25. Available in English. Engage actors in different sectors of society. 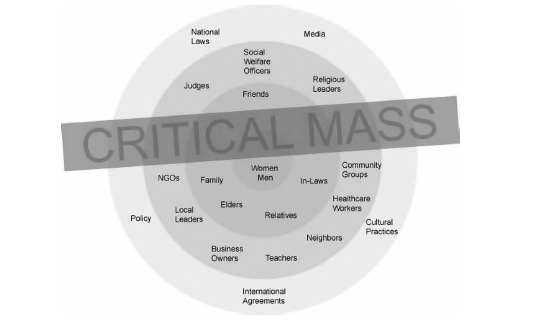 Community mobilization is about mobilizing groups of citizens, institutions, the media and government—that is, beyond the mobilization of individuals. Especially when addressing gender equality and issues related to violence against women and girls, and in addition to empowering local and grassortoos women’s and related community groups, it is also highly relevant to identify existing or potential youth and men’s groups or networks to work with so that they can play a key role in effectively mobilizing their respective constituencies. Raising Voices, an organization which works to address domestic violence, points out that everyone in the community must take action together in order to ameliorate all of the causes of violence against women and girls (Michau, 2007, p. 100). Similarly, community mobilization for safe cities for women should therefore be a holistic process whereby everyone’s actions contribute to a greater goal. Image Source: Michau, L. 2007. “Approaching old problems in new ways: community mobilisation as a primary prevention strategy to combat violence against women”. Gender & Development 15.1, pp. 95 -109. Offer to raise awareness about the issues and train people in the community. It may take some time before community members feel ready to face an issue as large as the safety of women and girls in public spaces. First they also need to understand the magnitude and consequences of violence against women and girls present in their own communities, in its various forms (including sexual assault and sexual harassment on streets, transport, neighboorhoods, etc.). It can be helpful to provide community members with specific training on women’s safety, communication, leadership, and other skills related to whatever specific community actions arise. This project, funded by the United Nations Trust Fund to End Violence against Women, uses theatre to mobilize the community with the aim of empowering women and girls and preventing violence against women). There are three key strategies being used in the project: behaviour change communication (changing people’s behaviours through participatory learning techniques); psychosocial healing (using various methods, such as therapeutic counselling sessions and family visits); and collective creations (using different kinds of cultural communication to express feelings, educate, build life skills, and more). The target audience for this project is varied – it includes women who have experienced violence, and also targets males who are at risk of perpetrating violence against women (Sistren Theatre Collective, 2009). Information on the project and videos for viewing of Sistren Theatre Collective performances are available in English. INSTIGATE! An Online Toolkit for Community Mobilization (Transforming Communities: Creating Safety and Justice for Women and Girls, California, no date). The toolkit is divided into nine sections based on the acronym INSTIGATE: Imagine, Network and Recruit Community Action Team Members, Start up the Team, Train for Action, Investigate Local Conditions, Gain Support from Allies and Partners, Attract Attention to Your Issue, Take Action, Evaluate. Each section provides instructions for programmes and organizations wishing to mobilize their community around issues of safety and justice for women and girls. Activities and forms are provided in each area. Available in English.